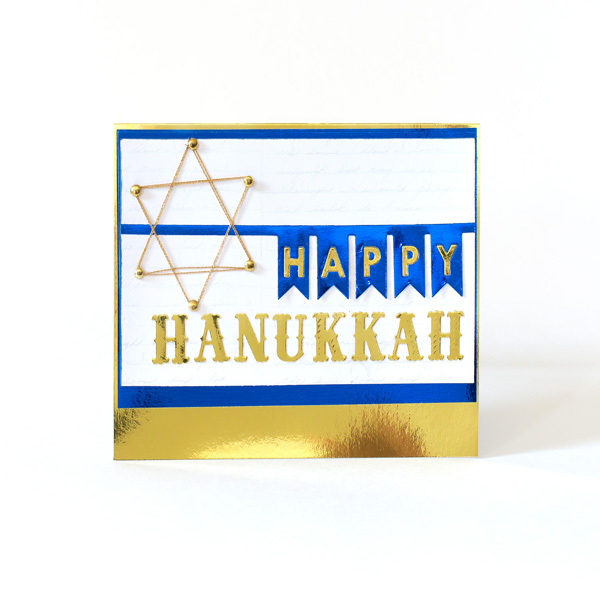 Project Description: Create your own Hanukkah Card for family and friends. Make 6-1/2″x5″ Metallic Gold top-fold card from foil board. Cut script paper to 6-1/4″x3-3/4″ panel; ink edges. Mat panel with 6-3/8″x4-1/4″ blue panel, leaving wider edge at bottom as shown. Die cut banner from both gold and blue card stock. Adhere blue banner across script paper as shown. Adhere gold letters to blue pennants using liquid glue. Secure edges of pennants to panel using Zots. Reserve remaining die cuts for another use. 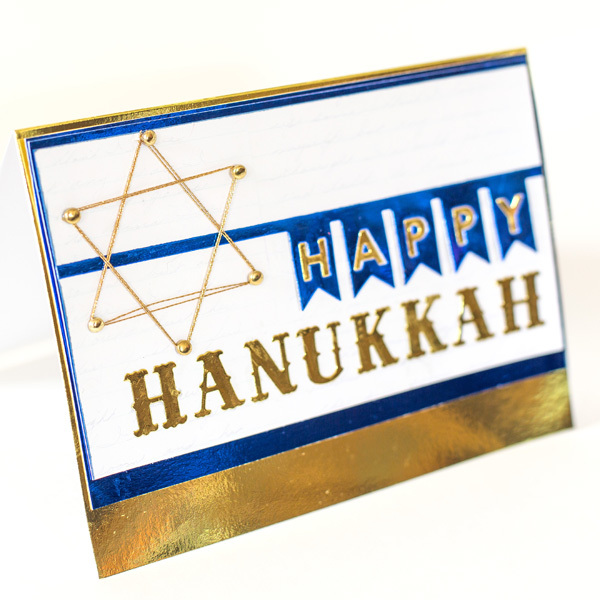 Die cut “Hanukkah” from gold card stock using alphabet dies. Adhere to panel below banner using liquid glue. Cut triangle from scrap paper. Using triangle as template, mark Star of David on panel by piercing hole at each corner. String star, working one triangle at a time. Thread needle; insert through one piercing from back. Attach three brads to form triangle. Wrap thread once around brad before advancing to next brad in triangle. Wrap two full times around previous triangle before tying to last brad. Secure thread end with glue pen; trim again if necessary. Repeat with second triangle. Adhere panel to card front as shown.